Stop by for a FREE Slurpee at 7-Eleven across America with no purchase or coupon required. The convenience store chain's giveaway promotion celebrates everyone's favorite season of the year -- Summer! This special is available at participating 7-11 Stores only on Wednesday, May 23, 2012 from 11 am to 7 pm and is good on the 7.11 ounce size Slurpee drink in flavor of your choice. The brand's insiders advice: "Don't miss our new Slurpee Lite™ Fanta Sugar-free Mango - 50% fewer calories." I love Slurpees and so do my teens. So I'm planning on surprising my kids with a detour on the way home from school on Wednesday to stop at our neighborhood 7-11. Actually, I can almost taste those tasty, tart, sweet, icy slush drinks now. I think I'm going to try the new Slurpee Fanta Sugar-free Mango. 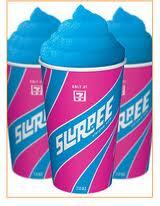 How about you, what's your favorite Slurpee flavor? Please leave a comment and tell us. FTC Disclosure: Mommy Blog Expert did not receive any payment or other compensation associated with this post. See complete FTC Disclosure information that appears at the bottom of MommyBlogExpert's main page and at the bottom of every individual post on this blog, including this one.